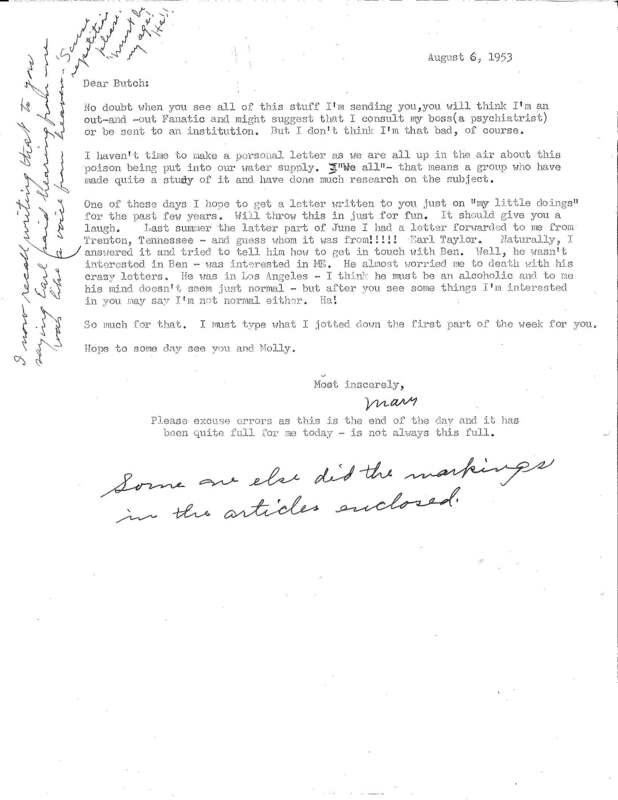 In addition to materials related to Butcher’s experiences during World War II, there is also correspondence with Eisenhower during his presidency, personal correspondence to Butcher’s family and a great deal of material chronicling Butcher’s career in the broadcast industry, both radio and television, before and after World War II. Some of these materials illustrate a time when the US government was determining the best way to regulate radio and television broadcasting and these are issues Butcher worked with in his role as a radio and television station owner. A great deal of the materials in this collection are from the 1950s, a time that the United States was engaged in the Cold War with the Soviet Union. 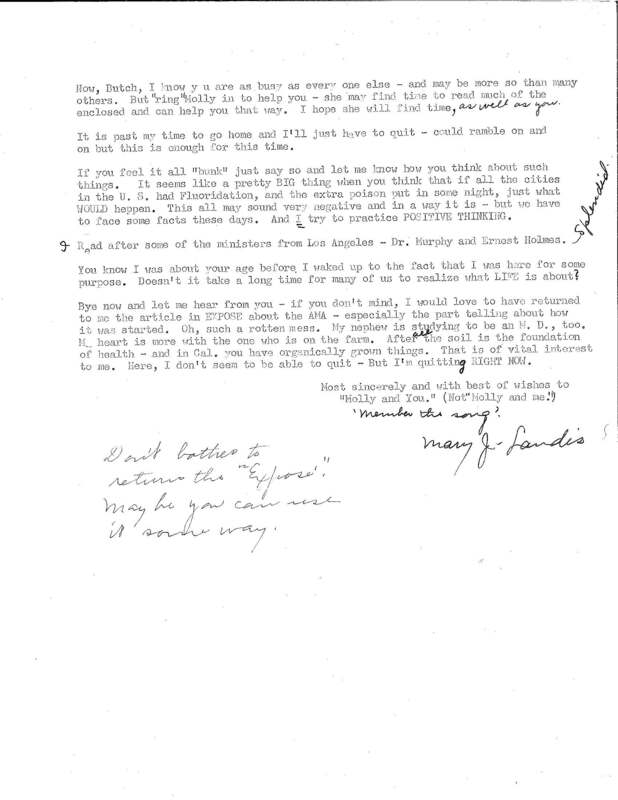 The Cold War manifests itself in the Butcher papers in interesting ways, but perhaps the most interesting way is in correspondence between Butcher and one of his acquaintances decrying the fluoridation of the water in Santa Barbara, California, where Butcher lived. 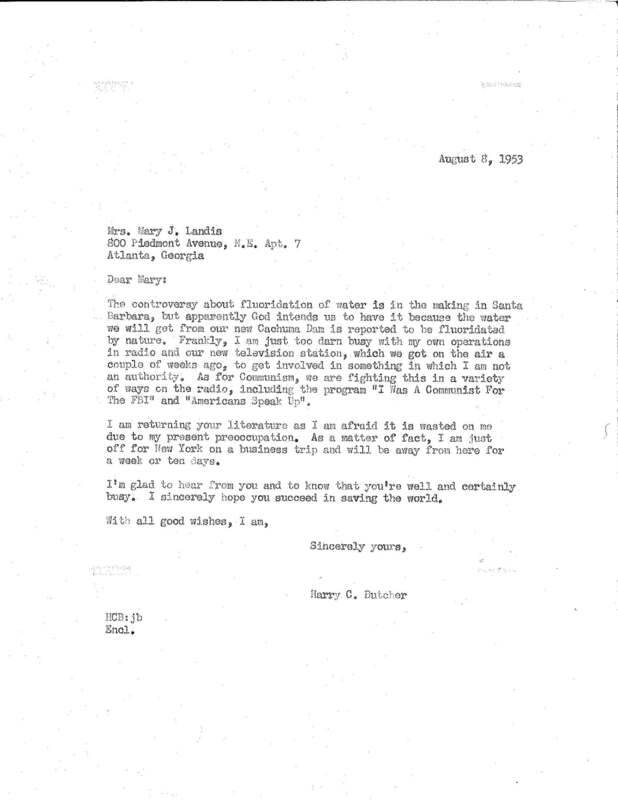 Letter from the Harry C. Butcher papers, Box 2, Folder 7. A conspiracy theory at the time had it that the fluoridation of American water was a communist plot that would turn Americans into mindless communists. This is a reflection of the Cold War paranoia that gripped American society at the time. 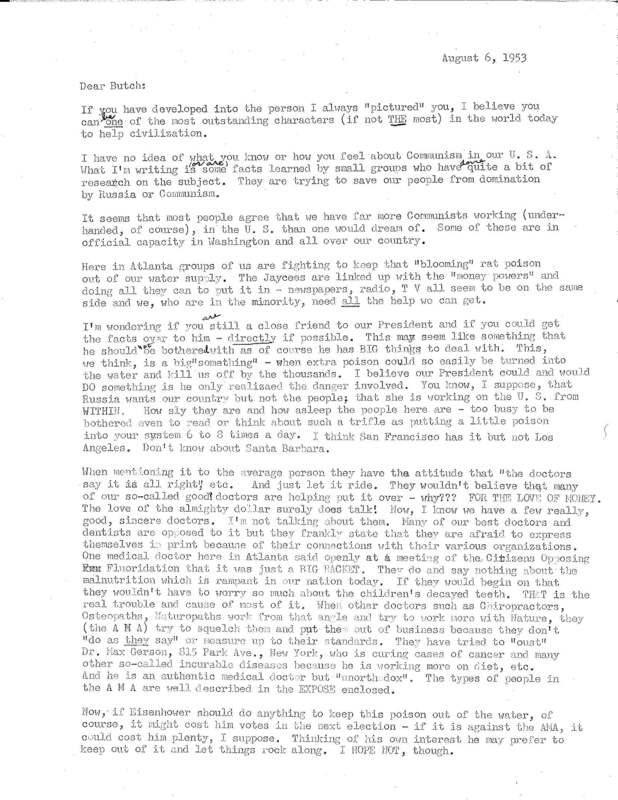 Other examples of manifestations of this paranoia include the Hollywood blacklisting and other activities of the House Un-American Activities Committee during the mid-1950s. An example of this paranoia in popular culture can be found in Stanley Kubrick’s satirical film “Dr. Stangelove,” which is centered around a nuclear attack on the Soviet Union put into motion by an American general fearful of communist infiltration by means of the fluoridation of American water. Other AHC collections that detail the Cold War in America are the Larry Adler papers, the Albert Maltz papers, the Adrian and Joan Scott papers and the Lester C. Hunt papers, among others. This entry was posted in Cold War, Journalism, newly processed collections and tagged Cold War, Fluoridation controversy. Bookmark the permalink.